Based on traditional patterns, these delightful little patchwork treasures are perfect additions to a quilter's decor. 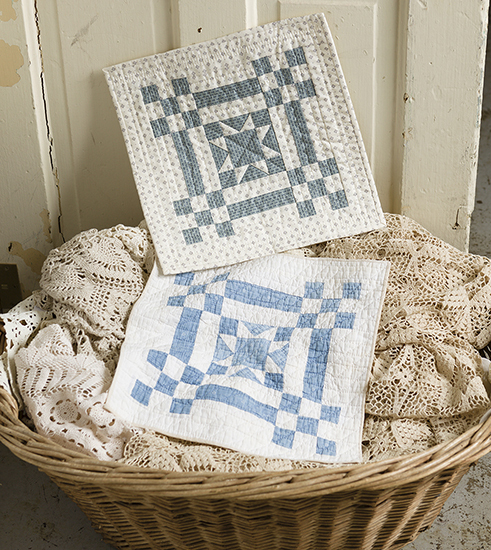 Stitch classic blocks using your favorite reproduction fabrics and create sentimental, handmade treasures you or a loved one will appreciate every day. 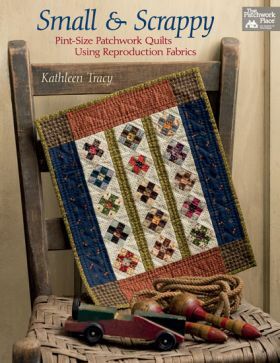 This is a book of pint-size quilts using reproduction fabrics. Of course, you could always update them and use brighter, newer fabric. After all, it is your quilt. There are 16 patterns and the book starts out with a tips and tricks section. The patterns include flying geese, pinwheels, hexagons, orange peels, window panes and disappearing 4-patch, among a few more. There is straight piecing and applique. The instructions include the name of the pattern, the finished size of the block and the project and a color photo. There is something about the pattern on the left edge of the page with the material and cutting lists. Graphics and easy to follow written words complete the pattern. 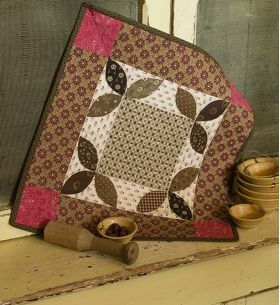 The quilting design is included and a URL is given if you want other ideas. At the end of the book is a 3-page section on quilting basics and a paragraph about the author. Wow! Love this book! 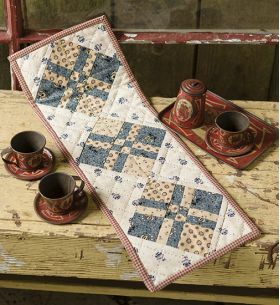 Beautiful small quilts, beautiful fabrics, beautiful photography. I want to make every one of these quilts. A little of everything from tips and tricks to quiltmaking basics included along with 16 lovely quilts. Thanks for always inspiring so many of us. Kathy never fails to revitalize the often forgotten techniques of simple, uncomplicated and classic quilt designs. This is Kathy. A woman who stitches from her heart. I did not hesitate to purchase this book as I trust Kathy will put her all in to each page. Kathleen Tracy did not disappoint with her new Small & Scrappy book. 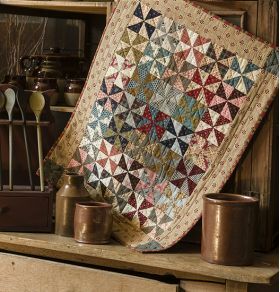 I love the variety of patchwork: stars, hexagons, orange peels, applique, flying geese, nine patchs, sixteen patch, and many more, including a double four-patch. Must admit that I spent the first week or so looking at the photographs of the sweet quilts in those lovely settings and totally overlooked Kathleen's Fabric Tips & Tricks". I can't wait to start stitching my way through this book! Kathleen Tracy has been playing with fabric since childhood. 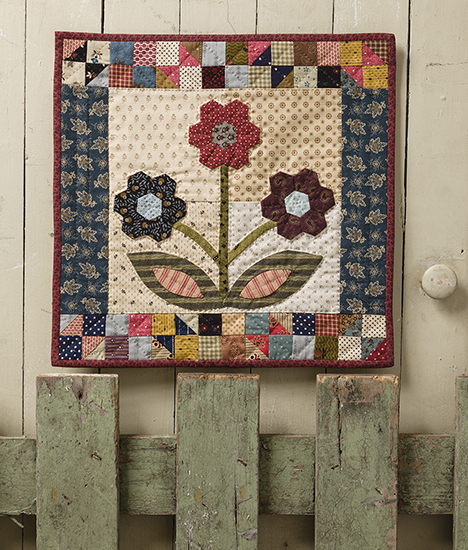 She designs patterns inspired by antique doll quilts for her quilt-kit company, Country Lane Quilts. In Small and Scrappy: Pint-Size Patchwork Quilts Using Reproduction Fabrics she draws upon her experience and expertise to train even the most novice of needlecrafters how to decorate with charming small quilts with historic details. Based on traditional patterns, these delightful little patchwork treasures are perfect additions to scatter throughout the home. 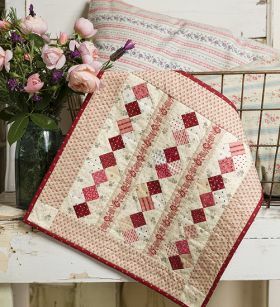 With the patterns and instructions found in the pages of this book, anyone can stitch classic blocks using favorite reproduction fabrics and create sentimental, handmade treasures that will be appreciated every day. Unique and thoroughly 'user friendly' in organization and presentation, Small and Scrappy is very highly recommended for personal and community library quilting instruction collections. The sixteen small quilts vary in size from an 11" square to a 26" x 36" runner. The traditional blocks, e.g. Flying Geese, Log Cabin, use reproduction fabrics, that is, copies of 19th century prints. The quilts use quick piecing methods and applique. Many of them are hand quilted with suggestion[s] for quilting designs. 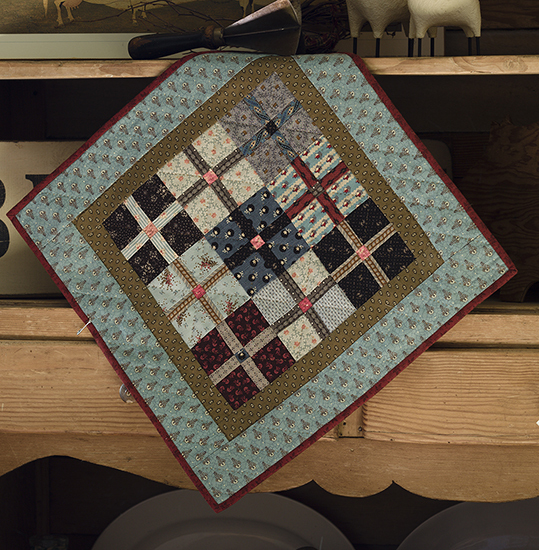 It is a good introduction to piecing and quilting, ideal for a beginner.